« “Hamlet on Spring Break” at Highland Park HS, St. Paul, Minn.
That's me at left playing myself. I rarely perform in my own work. I don’t claim to be an actor. Plus, I like to see my own work, partly so I can critique it. But my five-minute piece “The Year Dad Finally Lost It At Christmas” seemed like own where I should play myself. 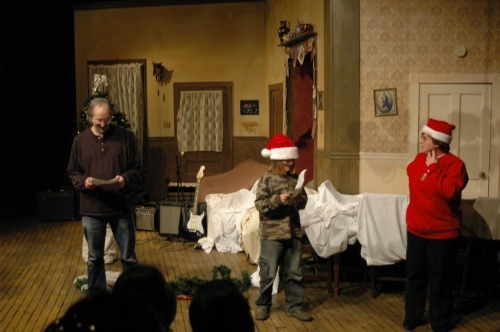 This was done at No Shame Theatre in Roanoke, Va., in December 2004. That’s my wife, Trina, and my son, Keith. In the final photo, Simon Adkins is the neighbor dressed as Santa Claus. This entry was posted on January 14, 2012, 12:00 pm and is filed under No Shame Theatre, Uncategorized. You can follow any responses to this entry through RSS 2.0. You can leave a response, or trackback from your own site.